Ruby Rose was in attendance at the 2018 G’Day USA Los Angeles Black Tie Gala on Sunday (January 27) in California. She wore a black Kaufmanfranco gown styled with Eva Fehren jewels. Eva Longoria Baston wore a Kaufmanfranco Resort 2017 dress to the Vanity Fair / HBO Dinner during Cannes Film Festival. Gwen Stefani made a guest appearance at the Tonight Starring Jimmy Fallon. 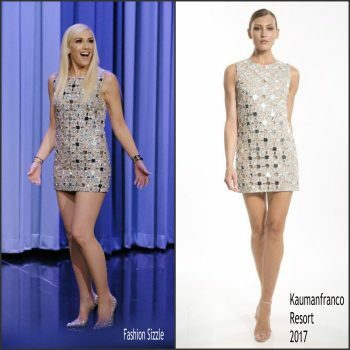 She wore a Kaufmanfranco Resort 2017 silver mirrored disc shift dress. Chanel Iman attends Glamour Women Of The Year 2016 at NeueHouse Hollywood on November 14, 2016 in Los Angeles, California. She wore a silver halter Kaufmanfranco Fall 2016 contour matchstick funnel gown that has side cutouts. US model Chanel Iman arrives on May 16, 2016 for the screening of the film 'Hands of Stone' at the 69th Cannes Film Festival in Cannes, southern France. 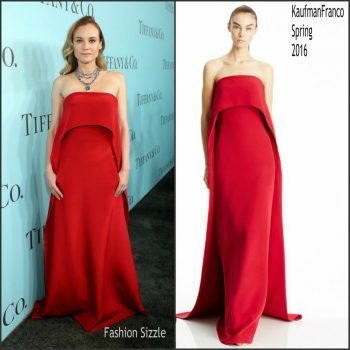 Diane Kruger was in attendance at the Tiffany & Co. Blue Book Gala in New York City on April 15, 2016. On Monday November 30, 2015 Naomie Harris attended the ‘Spectre’ in association with OMEGA ‘Spectre’ Japan Release Celebration After Party. The British actress wore a cream one-shoulder Kaufmanfranco Fall 2015 cut-out dress .